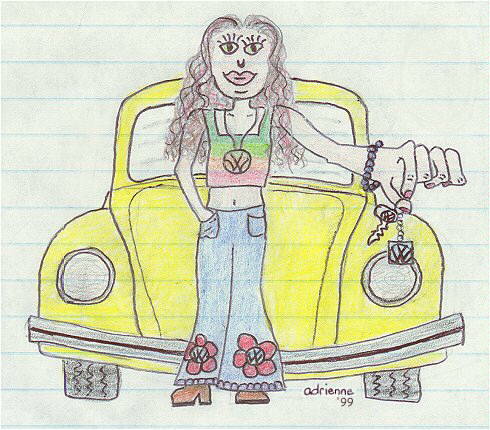 This is Arthur, the '73 Adrienne's Beetle. - My name is Adrienne, and I live in Minnesota, U.S.A. I'm 16 years old (as of this writing) and a junior in high school. 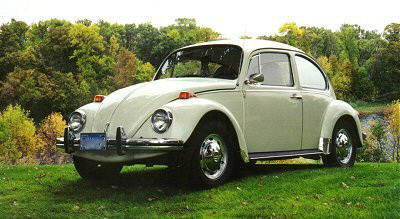 I have been interested in Volkswagens since I was about 13, and my dream came true when I recieved my beautiful 1973 beetle in August, 1998. I have been maintaining a VW website (Adrienne's Volkswagen Site) for the past 2 years, and it's been a lot of fun and a great learning experience for me. I have watch my site gain popularity, and i have recieved more than my share of suggestions and tips. (Luckily, I haven't gotten too many complaints!) I started my Total VW Webring in 1998, and I cannot believe that it now contains nearly 200 members! That's about all I have to say, so anyway, I am very happy to be a part of this Hall of Honor! Always remember: When you're down, think of a VW! It will make you smile! Adrienne accepted my Site to be part of her "The Total VW Webring", this allowed the divulgation of my Site to more than 200 webring members. Her webring is democratic and she is happy to have friends all over the world participating in her ring. If you would like to join "The Total VW Webring" please click on the logo at your left and fill the form. Come, be part of this nicely managed webring!